Bring wizarding world fun to any LEGO® set with the LEGO Minifigures 71022 Harry Potter™ and Fantastic Beasts™ collection. This lineup of exclusive, Limited Edition collectible characters features an array of new-for-August 2018 accessories and enchanting costumes. Enjoy all-new Fantastic Beasts adventures with Newt Scamander™, Jacob Kowalski, Tina Goldstein™, Queenie Goldstein™ and Credence Barebone™. Then take a journey to the world of Harry Potter with Luna Lovegood™, Neville Longbottom™, Cho Chang, Dean Thomas, Lord Voldemort™, Dobby™, Cedric Diggory, Mad-Eye Moody, Professor Flitwick, Professor Trelawney, Albus Dumbledore™, Harry Potter in School Robes, Ron Weasley™ in School Robes, Hermione Granger™ in School Robes, Draco Malfoy™, Harry Potter in Pajamas and Percival Graves! Each minifigure comes in a sealed ‘mystery' bag together with one or more accessory elements, plus a collector's leaflet and a unique display baseplate. Price is 14% below the initial Lego retail price, a € 0.54 discount! This comes down to 43.13 cent per brick. The Harry Potter™ and Fantastic Beasts™ (71022) Lego set is no longer directly available from the sites below. However, 3rd party partners of these sites might still have the set available. Alternate description Discover the magic of LEGO® Minifigures with the Harry Potter™ and Fantastic Beasts™ collection! Every collectible LEGO® minifigure in this series comes with one or more accessory elements, plus a collector’s leaflet and a unique display baseplate. 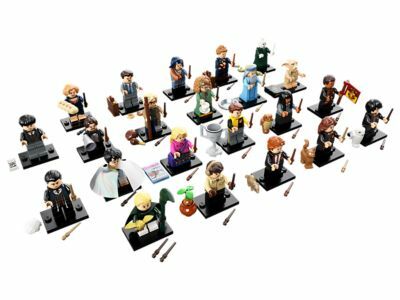 22 Limited Edition LEGO® Minifigures characters to build and play out your very own magical Harry Potter™ and Fantastic Beasts™ movie scenes! Includes new-for-August-2018 costumes and accessories, including Harry's Invisibility Cloak, a Golden Snitch, Voldemort's snake Nagini and Newt's Niffler and case. Combine the Harry Potter™ and Fantastic Beasts™ minifigures with LEGO® building sets for endless play possibilities. Have fun trading minifigures with your friends to complete your collection. PLEASE NOTE: Each ‘mystery’ bag contains one of the 22 characters available in this collection. Unfortunately, we cannot accommodate requests for specific minifigures. If you purchase more than one ‘mystery' bag, you may receive two or more identical minifigures.